This post’s purpose is a bit different than what I normally have done/plan to do – rather than simply writing about some given topic, I’d like to hear input from others. Don’t worry – this is a quick read. Recently, I had a conversation with someone where they stated that they prefer to start an anime series only after reading the plot synopses for every episode and plenty of reviews (both positive and negative), spoiling the ending for him/herself, and fulfilling many other conditions. Personally, I like to go into an anime/movie/whatever as blind as possible. 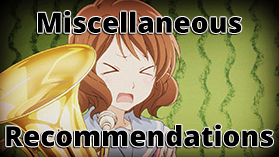 I’ll look at a general plot synopsis and, if it’s an anime, an overall rating on MyAnimeList or Hummingbird. I take any review or recommendation with a grain of salt and avoid spoilers like the plague. Of course, sometimes simply knowing the end result is not too much of an issue as long as the journey to that point is completely fresh. So, which side do you tend to fall on? And I am not solely speaking of anime here, this could be about movies, TV shows, video games, books, or any other media that presents a story. Let me know via the poll and comments – especially if you don’t quite fit into either camp. *The featured image is from Kotonoha no Niwa / The Garden of Words, which is worth watching for visuals alone. I just wanted some color in this post. I just don’t like spoilers when it’s a really good story, so I read reviews for everything to get an idea. I understand what you mean, but there are definitely a lot of times when some people will claim that something has a great story whereas I dislike it, which is why I take everything I hear with a grain (or bucket) of salt. More than anything, I suppose that I just don’t want major plot twists spoiled. I guess it depends on the genre. For slice of life I don’t care about spoilers at all, same for action-driven pieces (I can watch Redline knowing who will win the race, no problem). But for series where unexpected plot turns play a major role I try to stay away from any kind of reviews, manga spoilers etc.